American chemical society can be considered as the world’s largest scientific society, which was established in 1876 and chartered by the U.S. Congress with the mission of advancing the broader chemistry enterprise and its practitioners for the benefit of Earth and its people. The vision is to improve people’s lives through the transforming power of chemistry. Becoming a part of the ACS community will provide the members to join a network of nearly 157,000 chemists from around the world, get discounts on meetings and courses, gain access to exclusive career services and much more. Scientists and professionals from around the globe can collaborate and interact with each other in this trusted community. The ACS network provides the tools to allow scientists to work privately in small groups or to exchange ideas in a more public forum. The international equivalent of U.S. local sections are the International Chemical Sciences Chapters. 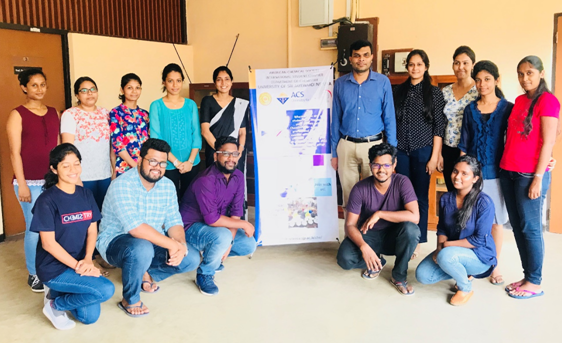 Our university has acquired the privilege to become a part of this massive network of American chemical society under the international student chapter category creating an excellent platform for undergraduates at University of Sri Jayewardenepura to become integrated into the global chemistry landscape and familiarize with ACS. Through this chapter, chemists outside U.S. can tap into efforts to advance chemistry around the world by joining or establishing an International chemical sciences chapters. These chapters can help chemists connect with one another in a geographic region or around the world and offer plenty of opportunities to learn new skills and grow professionally through appreciation of chemistry.